“We are like islands in the sea, separate on the surface but connected in the deep.” The spirit of this quote by William James is demonstrated by the connections that two very different schools have made. Sujatha Girls School in Colombo 5 is a school inaugurated in 2009 with just 13 students. Each year an extra grade has been added and now it has classes up to Grade 9 with over 1,200 students. Within a short time, this school has shown that it is on its way in becoming a high quality educational institution in the country. Two years back, when the school had difficulties in finding a mathematics teacher to teach the senior English medium class, they sought the assistance of the Overseas School of Colombo. The Overseas School of Colombo is regarded as the most prestigious international school in the country. It is the oldest accredited international school in Sri Lanka and the only institution to offer the highly recognised International Baccalaureate educational program. The school enrolment is about 410 consisting of about 50 different nationalities with a manageable teacher-student ratio. The school provides resources to create an ideal atmosphere for excellence in education and the development of the whole person. 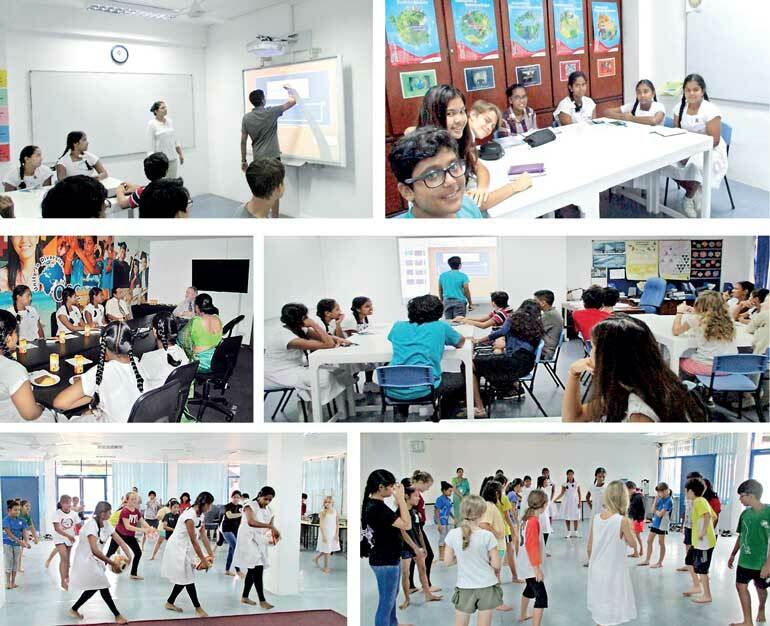 On hearing the news that the students of Sujatha BV are without a mathematics teacher, Nimal de Silva, who is the head of the mathematics department of the Overseas School, took upon the responsibility of conducting classes on a voluntary basis, in his spare time. Through these lessons, links were created between the two schools to have a positive interaction. Students of the Grade 9 class of Sujatha BV has visited the Overseas School on two occasions and they had first-hand experience of how the classes are conducted through inquiry based learning techniques and the use of resources to obtain maximum benefit out of these lessons. According to the comments that these visiting students made, they had found that there is a lot more discussion in the classrooms than in local schools and that the classes are conducted in a cordial manner with a very friendly relationship between the teacher and the students. They also found that technology is used extensively in lessons and that all students make use of lap-top computers. They were also thrilled to have had the opportunity of using smart boards. In return, the Sujatha BV girls conducted a dancing lesson to the Grade 5 students of the Overseas School. These students were excited to learn a Sri Lankan dance and they have planned to keep on practicing it to enable them to perform at the Sri Lankan Independence Day Assembly in February 2017. With this experience, the eyes of the girls would have opened about different systems of imparting knowledge, which will be of benefit for their future. They also met with the Head of the Overseas School of Colombo Phil Joslin, who explained to them the vision and mission of the school and the importance of having goals to accomplish whether it is an institution or an individual. OSC is regarded the most prestigious international school in Colombo, Sri Lanka. Founded in 1957, OSC remains Sri Lanka’s oldest internationally accredited educational institution. It is the only school in Sri Lanka to offer the International Baccalaureate (IB) Programme from Pre-school to Grade 12. At OSC parents and teachers partner in working together to create the kind of environment where children not only learn, but thrive.